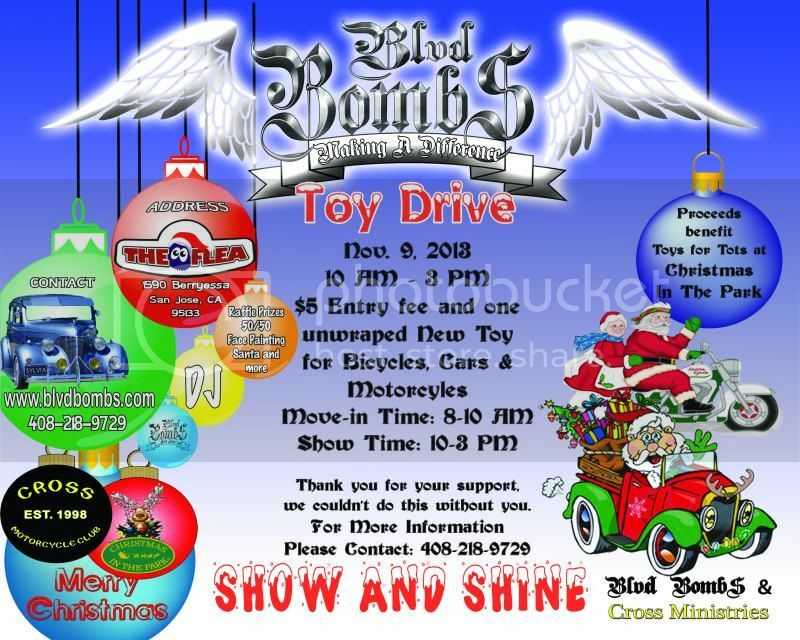 Next Saturday, November 09, 2013, Blvd BombS Toy Drive. Our car club for the last several years has been part of Christmas In The Park in San Jose, CA. They setup barricades for our club to display the cars and we take the toys donated to their Toys For Tots House. Not only do we take the toys donated at our Toy Drive, our club purchases many toys as well. With your help we can make someone's Christmas a little nicer. Often that might be their only gift. We are very grateful to everyone that has supported our fundraisers, we couldn't do this without you. Hoping and praying it will not rain, but we will be at our Toy Drive rain or shine. We are having free face painting, Santa, DJ and awesome raffle prizes. A special thank you to The Flea Market and Cross Ministries Motorcycle Club for their support and help. See you on the Blvd!